It may come as a surprise to avid ‘Piha Rescue’ viewers but the reality is that Raglan’s the training ground of choice for Surf Life Saving New Zealand when it puts its young lifeguards through their paces. 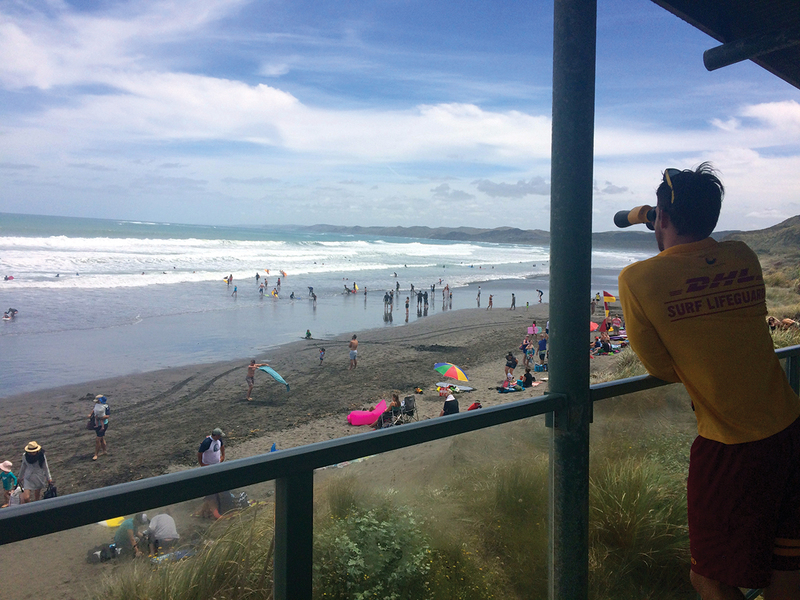 “We test them (lifeguards) in the best conditions available,” says lifesaving services and education manager Allan Mundy of Ngarunui’s consistent beach break. It’s no contest because the likelihood and the quality of waves at Ngarunui are so high, he explains. Every year around September – before crowds flock to the beach but when big storm swells are likely to hit – Surf Life Saving New Zealand mounts a major training exercise at Ngarunui. Typically 75-odd SLSNZ support staff, instructors, examiners and lifeguards (or candidates as they’re called at the training stage) converge upon Raglan from all around the country, Allan says. Most stay on site at the local clubrooms or at Kopua campground for the duration of the course, he adds, though some from relatively close-by commute daily. Raglan’s status as the country’s premier rescue training venue was revealed by SLSNZ in a media release about its charity partnership with rental vehicle company Thrifty. Thrifty supplies 10 4WDs – which Allan says are “our operational staff vehicles” – that assist in essential activities such as search and rescue and transporting volunteer surf lifeguards to training at remote beaches. The vehicles are an important part of the annual training exercise, Allan explains. Several are driven to Raglan from Auckland, Gisborne and the Bay of Plenty, some towing trailers with engines, equipment and of course the inflatable rescue boats that pluck swimmers in trouble to safety. Inflatable rescue boat instructor Gabriel Puckey-Brockelsby – who recently came across from the east coast to help train six new IRB drivers at Ngarunui – says that because many of the lifeguards are in their teens and don’t have cars or access to vehicles themselves, it’s the 4WDs that actually get them to training on the other side of the country. The boats are spread along the beach, a safe distance apart, while instructors and examiners put the candidates through their paces. Ngarunui is without a doubt the country’s best training ground for volunteer surf lifeguards, Allan reiterates, because of its rugged and challenging conditions. SLSNZ’s training and development operations ensure safety at more than 80 New Zealand beaches patrolled from Labour Weekend to Easter every year. 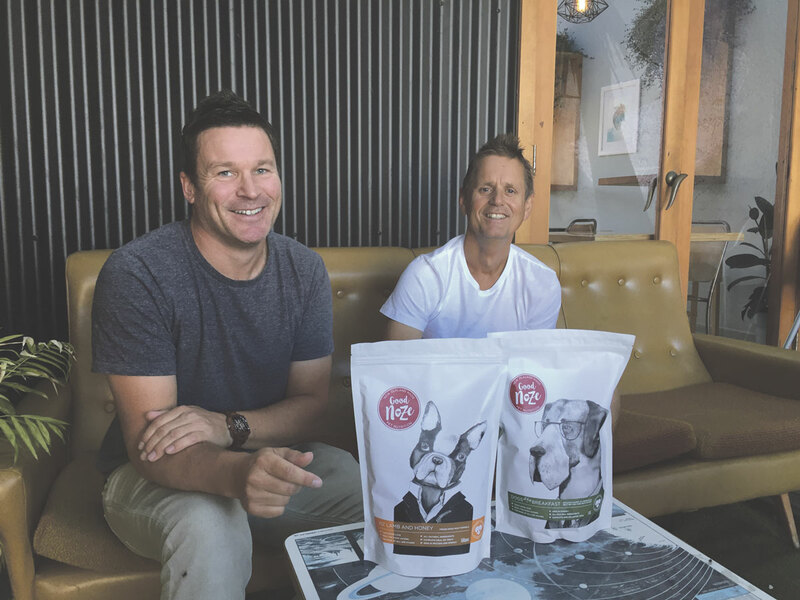 Two Raglan locals and good mates have started a natural pet food company right under our nose. Dave Smith and Frank Bellerby launched ‘Good Noze’ this week and we caught up with them to check it out. Where did the idea to start a pet food line come from? Born partly out of frustration really. Being an owner of some fussy pets and a pantry full of partially eaten pet food I realised that there was potential to come up with a new product to remove the stress and waste from daily feeds. Turns out, they weren’t fussy at all – I was just feeding them the wrong stuff. So you were trying to solve a problem? Pretty much. But I couldn’t solve it on my own because I knew nothing at that stage about animal nutrition. Frank, an animal nutritionist, was already in the animal feeds business and he was up for the challenge and liked the direction for his own business. We felt there was a gap in the market for a 100% natural and easy to handle product. Plus we convinced ourselves that it was possible to make pet food more attractive with the right product, packaging and marketing – kind of like how Eco Store transformed the way people looked at cleaning products. What was the goal in terms of the type of product you produced? The aim was to produce a sure thing! A natural product that no dog or cat could resist, but more importantly, one they should and would consistently eat. Once we discovered the freeze-drying process and understood it, we had our solution and were sold. The product is nothing but real meat that has been freeze dried, so the nutrients and taste remain, just the water is removed and with it the smell, refrigeration and handling issues. How long has it taken you to develop the product? From the genesis of an idea it’s taken us just over two years to craft, refine and test the product to the point where we know its totally pukka for pets. Your packaging is really cool, especially for pet food. How did you come up with the idea? We decided to ask our dear friend and artist Hayley Hamilton to create some characters that we could use. Hayley went totally above and beyond the brief. She provided a series of sketched images to choose from, then fleshed out characters, before finally delivering hand painted works of art. I recognise a few Raglan locations and locals on the website. Who did your website? Actually Maki from Raglan Ink designed our website… she’s awesome to work with. We wanted to showcase Raglan with all it’s beauty and character. Turns out Raglan was the perfect backdrop when trying to capture people and their pets hanging out together. Local Leanne Roughton, the photographer, was fantastic to work with in terms of interpreting our vision and nailing the shoots quickly. Huge thanks to Karamea of Raglan Ink, Ray at Raglan Barber, Steve and Candide of Raglan Kayak, Rach from The Social Club and Sarah at Rockit for helping us out. We have more photo shoots planned so the website is a work in progress. What are the benefits of the product? Speaking from experience, it really is the most convenient product to use. It’s natural, light and dry with minimal smell yet with all the nutritional goodness of raw meat. The tastiness means dogs don’t get sick of it and because it’s 100% natural you know you are feeding your pet only the good stuff. Any other products in the pipeline? Yes, we have also just launched another product. It’s called Dogs All Day Breakfast – a fusion of meat-bix and our freeze-dried product. Plus we have a freeze-dried product and an All Day Breakfast for cats on the way. Raglan Supervalue, Raglan Four Square and The Herbal Dispensary. And hopefully, in time, all Natural Foods stores up and down the country. Get a surf lesson at the beach with the experts at Raglan Surf School! Cruise aboard the Wahinemoe at sunset and explore the Raglan harbour. Book your stay with the Karioi Lodge Backpacker crew for everything Raglan on a budget. © 2019 Raglan Net | Travel & Visitor Information. All Rights Reserved.